A book of short stories, all of which center around Halloween and its traditions, may seem like an odd choice for holiday reading. I had originally earmarked this collection for part of my Booktober horror-novel marathon, but the wait list at the library was a lot longer than I had anticipated. Instead I got to enjoy these stories under the glow of my Christmas tree, which added a spooky sort of glow to the holiday season. 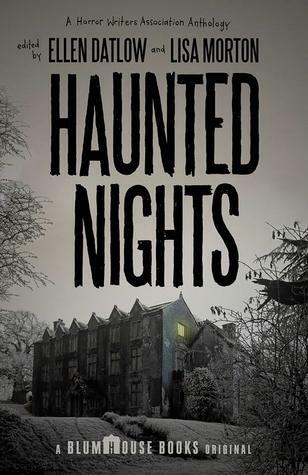 Haunted Nights was published by Blumhouse Books, which some horror fans may recognize as the production company behind many popular horror movies such as Grave Encounters, Insidious, and Get Out. All the stories center around some aspect of Halloween or one of the other holidays associated with death and the spirit world. As in any short story compilation, Haunted Nights has its highs and lows but overall, I felt that most of the stories hit their mark and delivered upon the atmosphere that editor Ellen Datlow was striving for. Ranging in length from twenty to forty pages, the short stories in Haunted Nights are great for a short reading session. The stories vary from the bleak and depressing “All Through the Night” to the delightfully creepy “Sisters”. My favorite was probably John Langan’s “Into the Dark”, which reads like the script for one of the found-footage horror films I’ve come to love and expect from Blumhouse. Halloween is my favorite holiday, and I read scary novels all year round. I would definitely recommend Haunted Nights as a kick-off to the Halloween season. This would be a great book to curl up with on a windy October night while you’re home alone. You can find Haunted Nights here on Amazon or here on Book Depository.